Etruria was a region located in present day Central Italy that gave birth to one of the first civilizations in Europe. The origin of the Etruscan civilization is a long-standing subject of debate among scholars from different disciplines. The bulk of the information has been reconstructed from ancient texts and archaeological findings and, in the last few years, through genetic studies. A new study that aims to investigate the biological origins of the Etruscans has revealed a migration event from the Armenian Highlands into Tuscany (Central Italy) at around 850 BCE. The analysis revealed that people of Tuscany poses a sizable amount of genetic traces from Middle East in particular the Armenian Highlands. 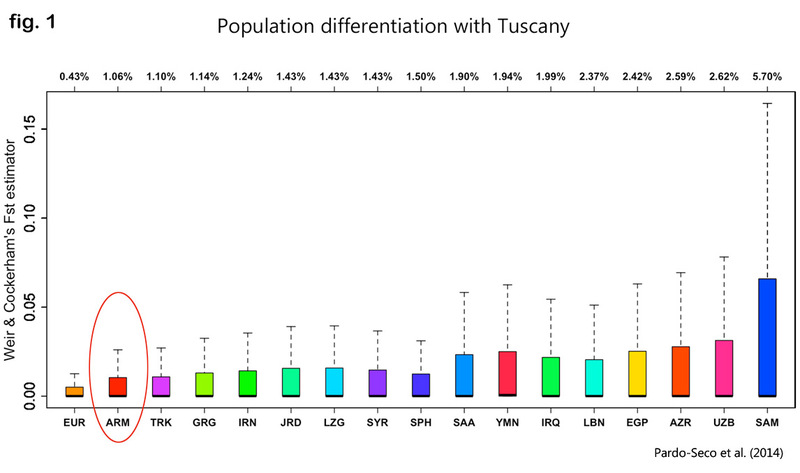 Among all the Mid-Eastern populations tested, Armenians show the least difference with the people of Tuscany. Thus Armenians along with immediate neighbors appear to be more closely related to Etruscans than other Middle Easterners which places the Near-Eastern components of Etruscan admixture in Armenian Highlands. An elaborate analysis has been applied to identify the date of this Near Eastern genetic influx with results pointing towards the Iron age period. In layman terms this means that a sizable migration event into (present day) Tuscany from the Armenian Highlands has occurred at around 850 BCE. Which coincides with the advent of the Etruscan civilization. This implies that as Ararat (Urartu) was forming into a formidable kingdom, a group likely from this very region migrated and settled into Central Italy. Interestingly, these results appears to coincide with the accounts of some ancient historians like Herodotus who theorized that Etruscans emigrated from Asia Minor around 1,200 BCE as the result of a famine. Coincidentally, another study published in Science Magazine (Hellenthal et al., 2014) has already shown a significant genetic Armenian component within the population of Tuscany (Italy). Genetic admixture of the population of Tuscany. Norwegian scholar Dr. Bugge, also suggested that the Etruscan language was of Armenian extraction. Other scholars like Vahan M. Kurkjian have identified Urartean art, architecture, language and general cultural traces of kinship to the Etruscans of the Italian peninsula. Armenian genetic traces among the populations of Tuscany therefore corroborate with the Etruscan-Armenian theory. Very interesting thank you … I am y male line J2A1B M67 . From northern England and this helps me put a lot pieces together . Ive often suspected my ancestors came with the Romans going further back were Etruscans .. And further back anatolia and Armenia .. Incredible thought . When compared to a map of j2 m67 the map at the top almost mirrors it . My Y-DNA haplogroup is J1 (J-M267) and my paternal line comes from Tuscany (near Pisa, Italy) traced back to the mid-1800s, so the connection with J1 and the Caucasus and the Armenian-Etruscan connection is very interesting. Lori province. In Armenia. Family. From. Italy. Researching more. Many people think I am from east Europe. Will find out. Armenia is the land of Celts and the Vikings! Armenia is the land of Germanic people also! I’m a proud Armenian! I am Southern German back to the 1400’s. My Y-DNA Haplogroups J2-M172, M92, Z515. We believe our first male migrated from Anatolia to Tuscany to Germany. We are most likely Etruscan.